Barrel Roll NewsCast - Megazord WiiU Spider-Man X-Men, OH MY! 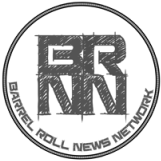 BrNN NewCasts - July 26, 2015 - We Be Back! Tony and Nick discuss where they've been and what's coming to BrNN in 2015. Little did they know that they would soon be set upon by life things and renovations. We'll be back soon in 2016!